I honestly have no memory of why I picked up Ratking out of all the other crime novels available. I guess it might be that I had heard that crime novels based in Italy tend to have an interesting focus on corruption and wanted to see what that was like. Quite possibly it might just be that the cover featured an actor whose work I am rather fond of, and I wanted to read the book before potentially tackling a new series. What can I say, I'm fickle. 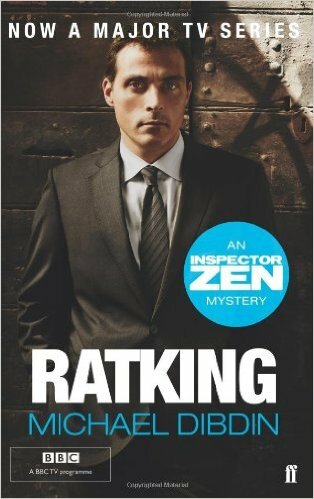 Ratking is the first book in a series following Italian police detective Aurelio Zen. After being unofficially demoted due to his actions on a past case, he finds himself being assigned to active duty again as part of a kidnapping case involving wealthy industrialist Ruggiero Miletti. What he arrives in Perugia to find is a fractured, unhappy family unwilling to cooperate with the police, a magistrate determined to find guilt for the kidnapping amongst the victim's family and a force unwilling to work for an outsider. All of this only makes the delicate situation with the kidnapping even more precarious, and Zen only has one chance at salvaging his career. Having finished the novel now, I find myself a bit torn. On the one hand, it is a very competently written crime novel, with no real glaring faults for me to latch onto. I suppose the thing that gives me pause most of all is more that I don't think I've ever read a detective novel where the main investigator is quite so willing to be completely underhanded in his methods. While I'm sure there are points in any crime novel where the investigator has to confront the whole question of do the ends justify the means, Ratking takes things further than I'm used to. There is no other series where I look at how the investigation has proceeded and think to myself that the detective stealing a car and planting it somewhere suspicious just so that it can be brought in for forensic testing is a reasonable course of action. While I can appreciate that the nature of the difficulties that Inspector Zen deals with do sort of warrant the extreme lengths that he will go to, it is a bit disconcerting that he does it so blithely. It doesn't really detract from the quality of the story-telling, it just might be a point to take into consideration if you were thinking of picking up Ratking: Aurelio Zen very much proves that you don't have to be nice or play fair in order to be a good person, and if you like your detectives to be more noble and just in their actions this may be a serious issue.